When you are using multiple numbers under one account, we have a few features to keep your conversations organized and to help you reply to a contact from the correct phone number. When you are sending a message to a contact, you may want to send your message from the same phone number they last received a message from to avoid confusing the contact. 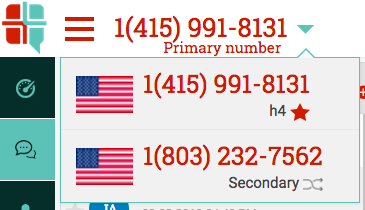 If the number you are sending from is different from the last # they received a message from, a message will pop up notifying you that it is different, and it will prompt you to choose to cancel and “send from the same phone number they received the last message from”, or to “proceed with sending from the current # that is selected”. 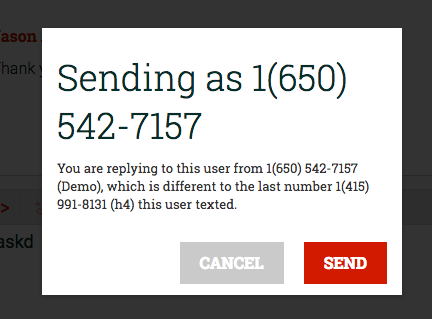 By default, your main number will be the number chosen to send your messages from. The number you have been assigned to is your main number. This number will have a star next to it indicating this is your main number.